What you need to know if you are thinking of filing an online divorce. Divorces are cheaper now than they have ever been in history. With the internet, people now have the option to choose from reputable companies who will prepare your divorce forms and send them to you ready to sign and file with the court. 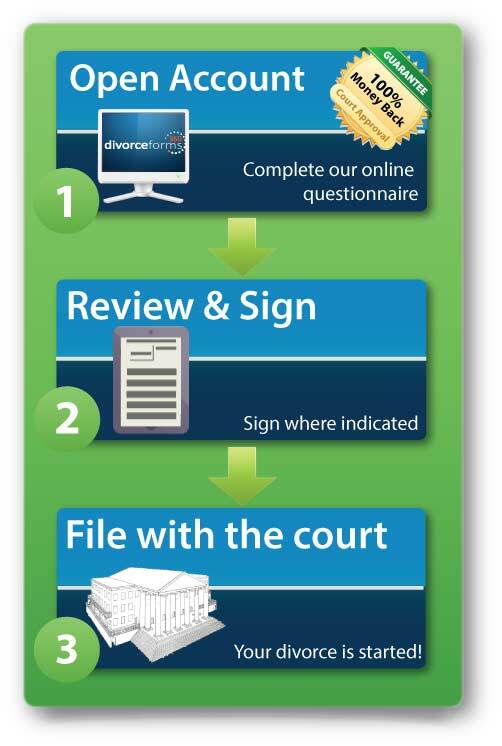 DivorceForms360 is one such company, who will allow you to go online for about 15 minutes and complete a questionnaire, and then have your divorce forms sent to you, ready to just sign and file with the court. But are all the divorce companies the same? There is some major differences that you should know about. Some have a staff of paralegals who will prepare your divorce forms for you while other online companies complete your documents with an automated computer system. An automated system can't make decisions on how best to prepare your divorce forms depending on your particular situation. A team of experienced divorce preparation specialists can make sure that your documents are prepared to suit your needs. Is “instant” divorce forms the way to go? While it is nice to be able to have instant divorce forms, the question is whether a computer system can really prepare the complex divorce papers with all the provisions that you want in your particular situation. It would seem that documents prepared by an experienced paralegal, who is knowledgeable with the laws of your State would be better equipped to provide you with documents that include all the necessary provisions for your divorce. Whether you have a complex custody situation, want special arrangement regarding support, or have unique requests regarding the division of your property, it would seem that an automated computer system would be challenged to be able to produce correct divorce forms. Is an attorney required in an online divorce? Most of the divorces filed today are filed without an attorney. You will not need an attorney to complete your divorce as long as you have an uncontested divorce. An uncontested divorce is a divorce proceeding where your spouse doesn’t file a response indicating a disagreement with what has been filed with the court. If you and your spouse don’t agree on certain terms such as custody, property or support, and your spouse files a response with the court, then you have a contested divorce. Having a contested divorce doesn’t mean you automatically need an attorney, but this is when you should seriously consider whether an attorney is needed. You can still do an online divorce even if your spouse’s whereabouts are unknown. In every divorce, your spouse must receive notice of the pending divorce. In divorces where the spouses whereabouts are unknown, the spouse will be served by publication or posting. This means that the divorce notice or summons will either be published in a legal newspaper or posted on the court wall. Once your spouse has been served, then the court can continue the divorce process. Will doing an online divorce same money? When you compare that average divorce attorney’s fees of about $3,500, getting an online divorce for under $200 is pretty inexpensive. The question really becomes whether you can do the divorce on your own without an attorney. Although the divorce process with the court is fairly simple, if you have never done it before, you can miss some of the procedures and have your divorce rejected. If you are doing a divorce , make sure you use a company who provides detailed instructions and has live support available to speak to on the phone. This will help make sure you are able to complete your divorce without an attorney. How do I start an online divorce? Getting a divorce is really pretty simple. There will be an online questionnaire that you will fill out to provide the information for your divorce papers to be completed. One such divorce company is DivorceForms360, who has an online questionnaire that you fill out. Once you have complete the questionnaire, the divorce papers will be prepared and sent to you to sign and file with the court. In today’s world, getting a divorce has become a fairly simple and inexpensive process. As long as you and your spouse can agree, you can complete your divorce for under $200, and many online companies will do it for as little as $149. The only other cost will be the court’s filing fee when you file the documents with the clerk of the court. So if you are to the point where you know that your marriage cannot be salvaged, then you can save yourself thousands of dollars by doing your own online divorce.